Perhaps somewhat surprisingly electric aircraft have been around for over 40 years now. Granted, the early incarnations of the 1970s were simply experimental projects but the idea has been in the public consciousness as well as research and development for a good four decades now. An electric aircraft is defined by the use of electric motors rather than internal combustion engines so the electricity to power the machine derives from solar cells, fuel cells, batteries and ultra-capacitors. This is far more economical but limits the size and capabilities of the aircraft significantly. Electric aircraft are typically unmanned as it’s easier and lighter for the aircraft to fly without a human pilot but in the last decade there has been a flurry of manned electric aircraft too with the successful landing of the Swiss solar powered plane two years ago after a 26 hour flight, being a benchmark for the technology. Solar powered aircraft are also very popular for the obvious reason that they’re infinitely more environmentally friendly than commercial aircraft that use internal combustion engines. Of course it depends on the type of aircraft but on average most modern airliners burn approximately 1 lb of fuel per passenger per nautical mile. So if we use that formula and apply it to a United Airlines Boeing 777 which has 348 seats, flying from New York City to Los Angeles (a journey of 2144 nautical miles) it would burn roughly 24.3 lbs of fuel for every mile travelled. That equates to a total consumption of about 52,000 lbs of fuel, or 7,760 gallons. Although we are a long way off solar powered commercial airliners with a fuel burn of that much you can see why so much time, money and effort is invested in the area. Because there’s no need to re-fuel planes can stay up in the air for an unlimited amount of time. This notion of perpetual flight is very attractive for trade and transportation flights rather than commercial flights. The time and money it would save without the need to land and re-fuel means more trade and faster transportation of goods and resources which is again, more economical. 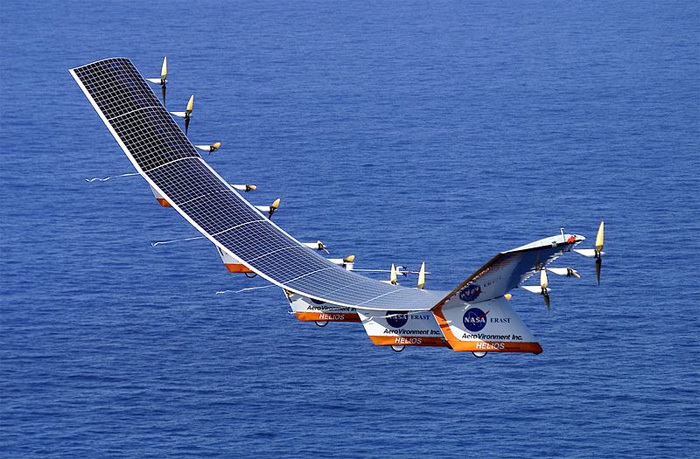 Solar powered aircraft commonly have big wings this is to maximise the surface area covered in solar panels and because the body needs a wider wing-span to keep in the air. Both electric aircraft and solar powered aircraft are a long way from being commercially viable as airliners but the technology is developing at a rapid pace so perhaps in another 10 years we’ll be flying in planes with solar panels on the wings. Jack Lockyer is Digital Marketing Manager at Chapman Freeborn, the world’s leading air charter service company.